The current edition of the journal System Dynamics Review, features an article by our team here at Climate Interactive on our simulation C-ROADS. With over 700 users worldwide and counting, C-ROADS has improved the understanding of which national climate commitments will have an impact and what is needed for us to close the gap between maintaining a safe livable planet and crossing tipping points that may have dire consequences. Our latest publication on C-ROADS reviews its uses and capabilities and explains a little bit of its structure and design. If you are new to C-ROADS and would like a better understanding of what this simulation can do for you we recommend checking out this article in particular. C-ROADS is available for free on our website. On our website you will also find much more detailed information and resources for you to explore as well. Sterman, J., T. Fiddaman, T. Franck, A. Jones, S. McCauley, P. Rice, E. Sawin, L. Siegel (2012). 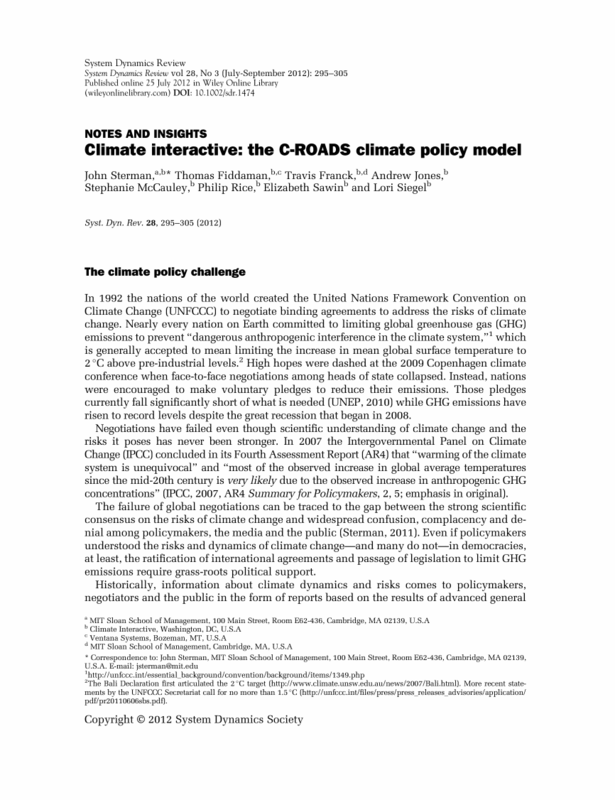 Climate Interactive: The C-ROADS Climate Policy Model. System Dynamics Review 28(3): 295-305.